Ahh Rome, the open-air museum of the world, and home to some of the most delicious, authentic food in the world. People travel far and wide for a piece of their famous beer fried cod-fish, mortadella pizza and red wine, and I’m no different. 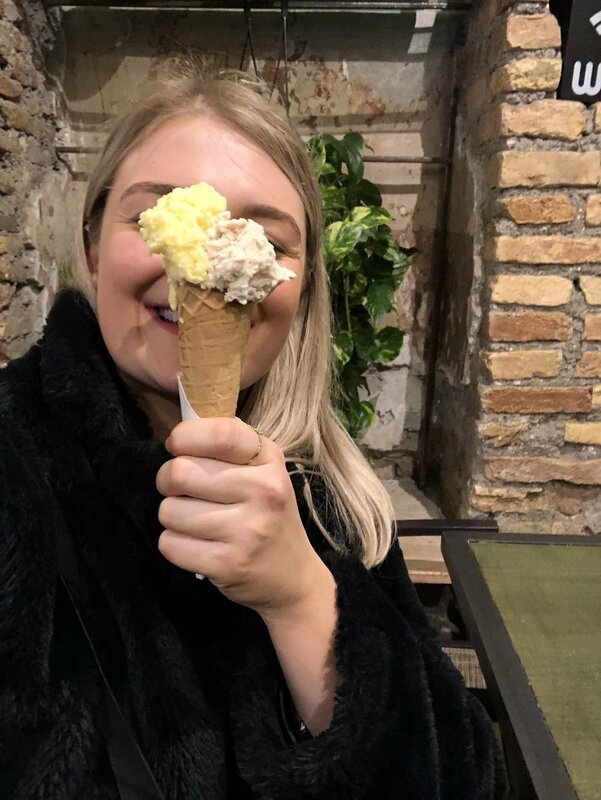 I knew I wanted to try every type of food in Rome, and went on the hunt for the perfect food tour. When I stumbled across The Roman Guy, I knew they were the one. They’ve got amazing reviews, and a wide range of tours to suit everyone. We opted for the The Local Foodie Tour in Trastevere, which I couldn’t recommend more. It started in Piazza Farenze, in front of the French embassy. It’s a gorgeous building, and from the outside you can see works by Michaelangelo that line the walls. Fun fact, our tour guide told us that the French only pay 9 euros rent for the building – it’s a 99 year old deal they have with the Vatican. Our tour guide, Dimitri, was very knowledgeable. Before we began the tour, he introduced himself and told us about the tour. It sounded amazing, and we couldn’t wait to get started! First stop was at a local patisserie, where we had what is traditionally known as ‘Roman Pizza’. It was slices of mortadella and mozzarella in a doughy bread, and absolutely delicious. We washed it down with a glass of red wine, and traditional biscuits. Next stop was a local fish shop, known for their legendary fried fish in beer batter. It’s lighter, which means less calories and even more taste. We had a glass of delicious white wine, and learnt about how the shops has been there for over 200 years. We then headed to the famous Traverste, located across the bridge into what is more of a ‘hipster’ neighbourhood. We landed in a small, local restaurant and learnt about the important of wine, and how to spot the good from the bad. They cracked open a good (lucky us!) bottle of wine, and brought out appetisers, including a melt-in-your-mouth veal, spinach and kale dish and an antipasti plate of meats and cheese. This was followed by a plate of homemade pasta, and a shot of limencello. Four our last stop, we landed in the gelataria of my dreams. There were flavours galore, but it was unanimous – the custard cream is to die for. Overall, it was a wonderful night where we learnt so much about the Roman culture, and the food. I’d highly recommend using The Roman Guy and can’t wait to try another of their tours when I’m back in Rome.